First, measure the depth and width of your current cushion. Use a straight edge ruler to get a precise measurement. Since we make cushions in half-inch increments, you will need to round up or round down to the nearest half inch. If you have an extremely misshapen cushion then measure the area you want to cushion to be placed in. 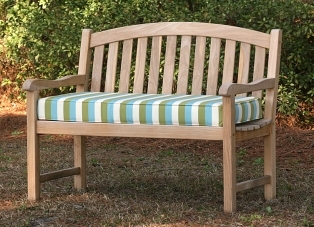 If you don't have a cushion at all, you need to measure the depth and width of your bench seat. Next, you will measure the thickness of the cushion, or the thickness you want. When measuring for thickness, make sure to measure in one-inch increments. Lastly, if you're going to purchase separate bench seat and back cushions, please remember to subtract the thickness of the bottom cushion from the height of the back cushion. Our cushions come with hidden zippers so they are easy to care for. Just remove the poly fiber or foam when its time for cleaning and spot clean your fabric.